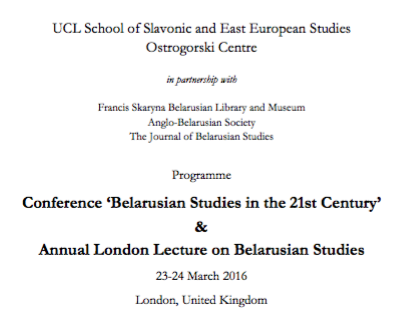 Conference Belarusian Studies in the 21st Century’ and Annual London Lecture on Belarusian Studies will take place on 23-24 March 2016 in London. The conference will serve as a multidisciplinary forum of Belarusian studies in the West and offer a rare networking opportunity for researchers of Belarus. 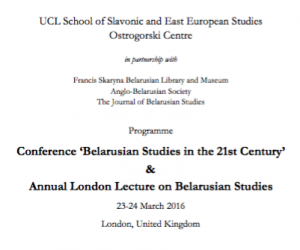 It is organised by the UCL School of Slavonic and East European Studies and the Ostrogorski Centre in partnership with Francis Skaryna Belarusian Library and Museum, Anglo-Belarusian Society, and the Journal of Belarusian Studies. For those who have completed the registration form before 22 March 2016 the attendance is free. This entry was posted in ABS and tagged conference, london, Skaryna library, ssees, UCL. Bookmark the permalink.